Pick N Play structures are designed to be fully customizable, so that you can design the exact item of playground equipment that you want for your playground. They use a Pick N Play Center Post which has spots for attaching up to 4 additional pieces. 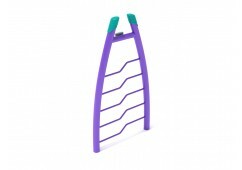 There are a large number of different attachment options available, including climbers, ladders, and overhead spinners. This allows you to design a play system that is ideal four your location, budget, and personal preferences. Select an arrangement of pieces which offer a fun and diverse blend of activities. All components are made from highly durable components which are sure to entertain children for years and years to come. All pieces are easy to install, and can easily be replaced with others later on if you choose to go with something a little different. All of our Pick N Play products are made to be both safe and fun—there are no wrong answers!